traveling with a laptop is not as simple as just packing the laptop and go; it is more than that. along with the laptop, you have a host of ancillary items to go with it like the power adapter, mouse and mouse pad, and since you are traveling you probably have other essentials such as shades, smartphone and perhaps, a notebook/magazine or two. given a take-it-all bag, you probably would be over-bringing which is not a good thing because of the resulting heft and not to mention the hassle of security checks. 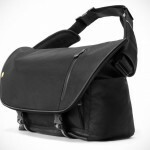 this why sometime we need a bag like the Booq Viper Courier Laptop Bag. 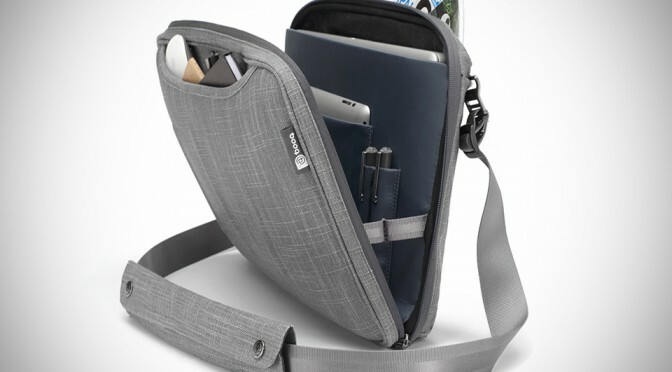 actually, it is not a bag per say, but more like a sleeve that can swallow up to a 15″ Macbook or equivalent PC laptop, and still have room for your iPad, notebook, mouse, magazines, pens and more – doing it all while still maintaining an ultra slim form factor. you can carry this organically dyed, water-repelling natural fiber accessory as a sleeve or turn it into a shoulder bag with the included, removable seatbelt nylon shoulder strap. 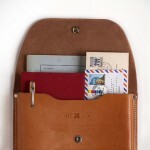 on the nylon lined inside, you will find a densely padded dedicated laptop compartment, a dedicated iPad pocket, a pair of pen slots, and a zippered pocket for other miscellaneous stuff. robust and proven YKK zippers are used were zippers are required, such as the said inner pocket and main opening of the bag. on the outside, there is a pair of tuck-away carrying handles for comfort carrying and two large pockets: one for your magazines and the likes, and the other for misc flat items, including a concealed quick-access pocket for your iPhone. 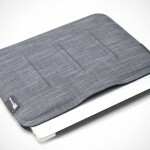 the Booq Viper Courier Laptop Bag is available to fit 13″ MacBook and 15″ MacBook (or equivalent PC laptop for both models) for $99.95 and $109.95, respectively. take a few more look in the gallery below.